LOUDON, N.H. – On October 18 the NASCAR Whelen Modified Tour champion’s trophy will be handed over to a driver at Thompson Speedway. 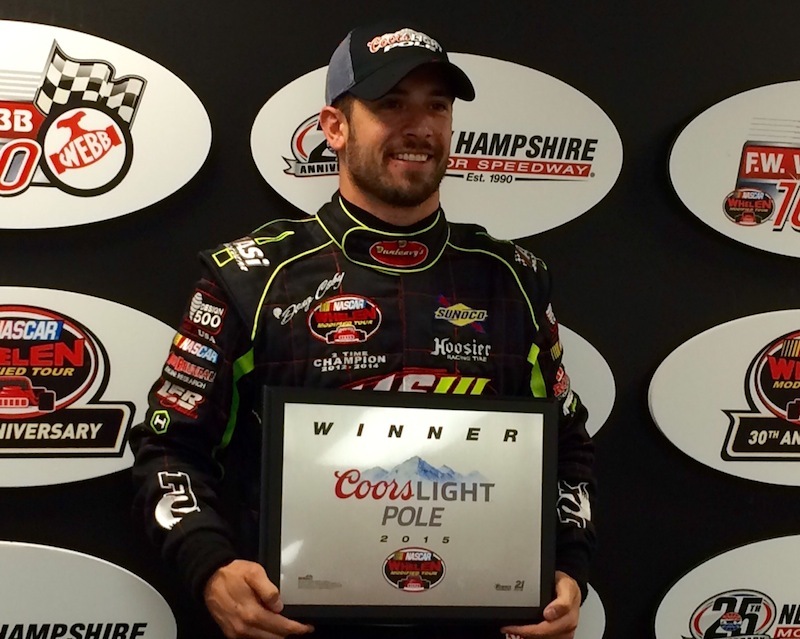 But for reigning series champion Doug Coby, title deciding day could be Saturday at New Hampshire Motor Speedway. With three races remaining this season, Coby sits third in the standings, 25 points behind leader Ryan Preece. Woody Pitkat sits second, one point behind Preece. Coby’s mission to chase down the two driver’s in front of him will begin from the best spot on the track Saturday in the Whelen Modified Tour F.W. Webb 100 at New Hampshire Motor Speedway. Coby, of Milford, won the pole in qualifying Friday at NHMS. After Saturday’s event, the series visits Stafford Motor Speedway for the NAPA Fall Final 150 on Oct. 4 before the season finale Sunoco World Series 150 at Thompson. All three drivers have proved to consistently to be front runners at both Stafford and Thompson, meaning Saturday’s event at Loudon is likely Coby’s best shot at making up ground in his attempt to win a third series championship in four years. Pitkat, of Stafford, will start third Saturday. Preece starts 17th. Coby toured the 1.058-mile oval in 29.130 seconds (130.752 mph). Bobby Santos III of Franklin, Mass. was second fastest with a lap of 29.249 seconds (130.220 mph). Pitkat had a lap of 29.256 seconds (130.189 mph). “I was a little bit nervous,” Coby said. “We were going out ninth, which typically here you want to go out later in the draw. I guess maybe we’re qualifying a little bit later here today so maybe that had a little bit of an effect later in the qualifying order. I just drove the car for all I could and knew that we would hopefully have a top six or seven car. It felt really good on the first lap and that was our fastest lap and I actually thought I went faster on our second lap and I went slower. You just never know when you’re out there what you have and you just have to drive it as hard as you can and roll it into the corner and get back into the throttle as hard as you can and see what your lap time is. You really just don’t know. Sometimes you go out there and you think you have the fastest lap ever and you’re like 15th. And sometimes you think you’re not that great and you end up in the top-three. Can’t wait to see the Jerry Cook throwback car today! Good luck Woody!